Allow your products to sell themselves! Selling products effectively online generally means ensuring that you provide the most comprehensive and compelling content for every product. This range of information is known collectively as Rich Data. 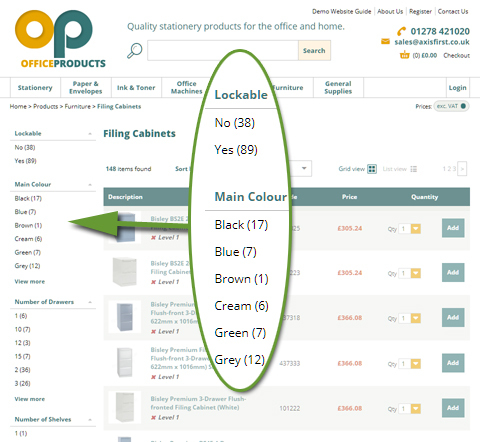 Fortunately, for those operating in a number of markets (in particular Office Products, Printer Consumables and Technology), there are 3rd party suppliers of product data that cover some or all of the areas listed above. For those who are unable to take advantage of an established supplier of rich data, either because you operate in a different market or because you are producing your own products, all of the data types described above can be maintained in axis diplomat so the tools are available to allow you to maintain this information yourself. Different providers publish updates at varying intervals but your axis vMerchant web server will check every day for updates from your chosen data provider. When an update is found, it is automatically imported into your website and data matched to the stock items published from your axis diplomat system (by either primary or alternative references). This means that, once configured, you can sit back and leave the automated systems to look after the website's rich product data - there are no imports or manual updates to run.